Owned and managed by Ketara Media Sdn Bhd. All rights reserved. 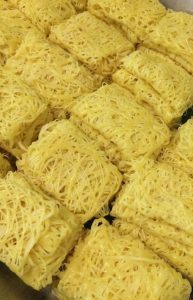 Roti jala, also known as “lace pancakes” in English, is directly translated to “net bread”. This makes perfect sense knowing that Malays come from a heritage of living close to the sea and making a living as fishermen. It is a popular Malaysian dish enjoyed savoury with all types of curry or sweet with durian cream. I find it is a particularly popular dish to make when guests come over. While Westerners find comfort in pancakes and maple syrup, we find it in roti jala with chicken curry. While roti jala is a Malay creation, chicken curry is Indian. The combination of these two elements showcases a wonderful aspect of Malaysia, the organic coming together of race and culture which is perfectly reflected in our food. We have some of the best food in the world including nasi lemak, roti canai, laksa curry and the list can go on and on. Our food is the best of who we are. 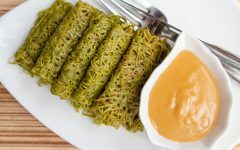 Being the wife of a diplomat, roti jala has been a go to dish that I served foreigners as an introduction to Malaysian food. It is a delicate lovely pancake that looks like a doily. Sounds unique right? I cannot imagine a more beautiful introduction to our food. It is sure to fascinate your guests and is a great conversation starter. Roti jala is also a dish I often serve to Malaysians overseas. It is a guaranteed hit. Adults love it and our children cannot get enough of it. 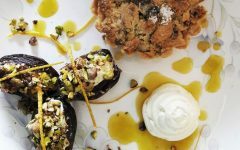 You will often find them either stuffing the entire piece into their mouths or unfolding each pancake and savouring every bite. There’s fun in the making of it as well as the eating it. How can anyone resist? The recipe is actually very easy to make. Creating the lace effect isn’t too hard either. After a few rounds of practice, you’ll see your lace pancakes start to look prettier. It’s fun to serve and fun to make, so let’s get started. In a large mixing bowl, whisk together the flour and water until it forms an even batter. Make sure you don’t have any lumps. Whisk until the batter is smooth. If you find that it is still lumpy, run the mixture through a sieve into another bowl to remove any leftover clumps. Lay a sheet of aluminium foil on your kitchen surface, close to where you will be cooking the roti jala. This is where you will be folding the cooked roti jala. Also prepare a plate. Heat cooking oil in your skillet or pan over high heat. 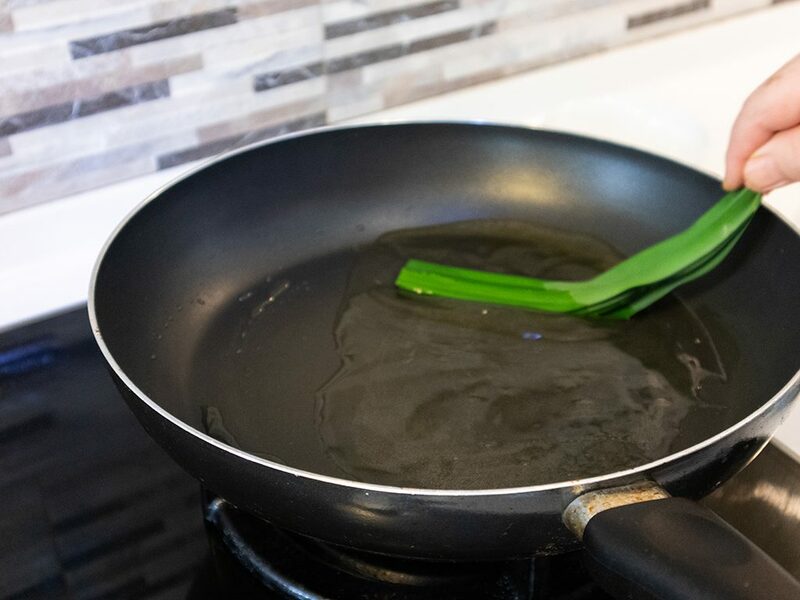 Use your tied pandan leaves to ‘stir’ the oil. This releases some of the pandan aroma into the oil. 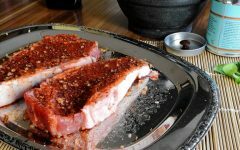 Once oil starts to sizzle, transfer it to a heat-proof bowl. Keep the pandan leaves which we will use as a ‘brush’. Turn the heat down to medium. Fill your roti jala dispenser to at lease half-way or more. Note that one roti jala will use about a quarter of the batter in a funnel. You have to work quickly. Roti jala cooks in approximately 20 seconds. Bring the funnel over the pan and move your hand in circular motions creating a flower like pattern. Don’t move too fast or you’ll end up with dribbles but don’t go too slow or your lace work will look thick and clunky. Just have fun and remember that if you have never done this before, it will take several tries before you get the hang of it. 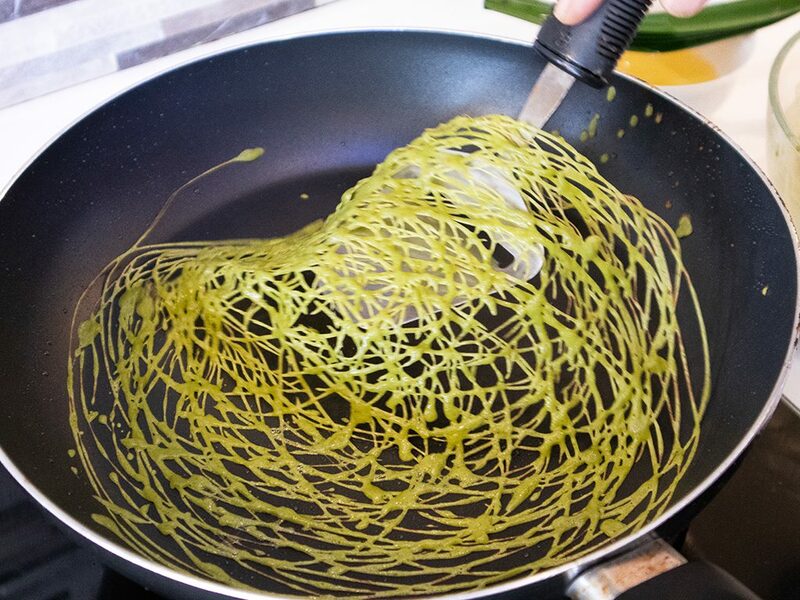 Once you have completed the lace pattern, use the pandan leaf to dab some of the cooked oil on top of the roti jala. Use a thin spatula to gently lift the roti jala from the pan and transfer it to the aluminium foil and move on to make another roti jala. While the next roti cooks, fold the roti jala. There is no wrong way to do this so have fun making it into rolls, squares, rectangles or triangles. Use a good non-stick pan. Roti jala is fragile so it needs to come off easily from the pan. A thin spatula will also help you in lifting the individual roti jala of the pan. Batter consistency is also very important when making roti jala. It should not be too watery, nor should it be too thick. When you’re creating the roti jala, don’t twirl the batter over the pan too fast. Keep a steady pace. You want to create fine threads on the pan. Do not despair if your first few tries don’t look right. Keep practicing. After several tries, you will find your roti looking better and better. 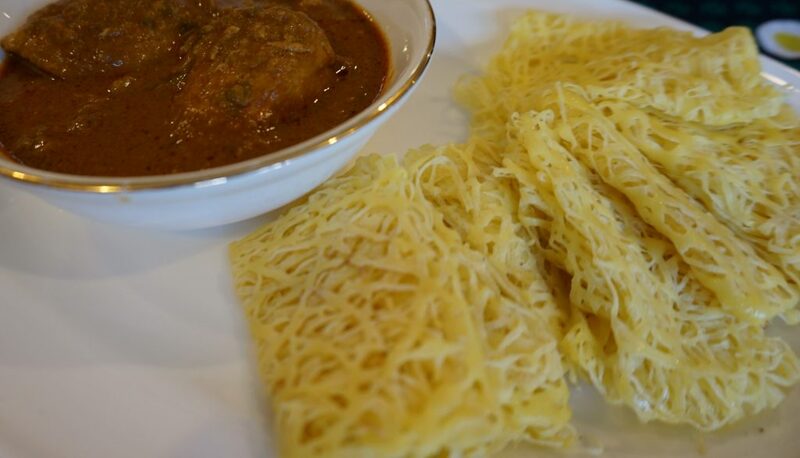 Roti jala can be eaten on it’s own or served with a side of savoury or sweet. Think of it as something like rice if you’re going the savoury route. I recommend pairing it with curries, spiced beef or rendang. If you have a sweet tooth, Malaysians like eating roti jala with durian cream. Although making durian cream may be a little bit risky if you are serving foreign guests. It certainly is one of those flavours, or should I say aromas, that either cause excitement or horror. While it is a flavour I absolutely love, I would not recommend introducing it to guests you do not know very well. They could end up running for the hills. 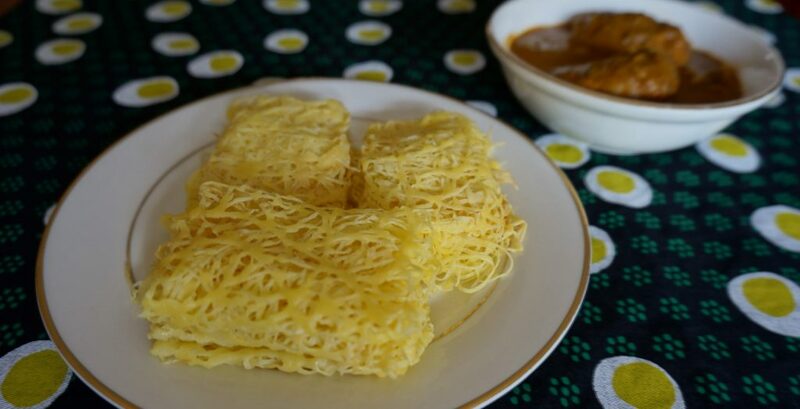 For other sweet alternatives, try roti jala with a side of homemade kaya! If you want to learn how to make roti jala with me, join one of my classes. Other than roti jala, I have classes on dishes ranging from nasi tomato to roti canai to good old curry puff. We’ll have tea, coffee, learn to cook, enjoy the fruits of our labour and get to know one another better. Mari makan. Click here to register! I have my mother, sisters and decades worth of friendships to thank for all the knowledge I have in cooking. To me, this is how I show people that I care and that they are welcome in my life. 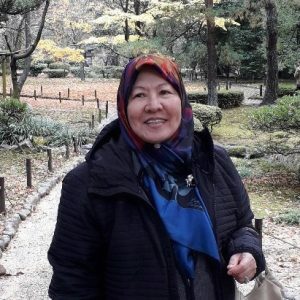 Being the wife of a diplomat in service for three decades, cooking and teaching others about Malaysia has become second nature. What better way to do that than through our food! With decades worth of cooking experience, I love nothing more than to share my experience, recipes and knowledge as well as continue to learn from others. 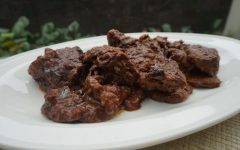 Lamb Neck Fillet: Chef Adu Amran’s Winning Recipe! 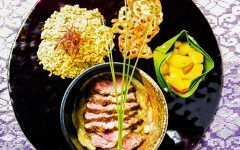 Love Malaysian food and culture? 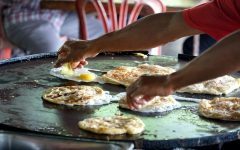 Find Malaysian recipes and stories on culture here in the Butterkicap community. Join us. Show the world just how amazing Malaysian food is. Get bite-sized recipes, stories and favorite Malaysian childhood food memories delivered right to your inbox. Owned and managed by Ketara Media Sdn Bhd.